Daytime Audio - Listen On The Go! Do you suffer from acne problems? 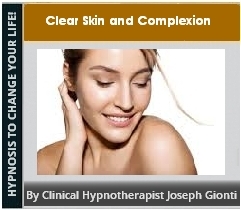 Our clear skin hypnosis MP3 can help improve the quality of your skin and reduce spots. The first thing that people notice when they see us is our face. So it is only natural that skin problems can affect more than just our appearance and looks. It can lower our confidence, affect our self-esteem and make us feel uneasy and less outgoing. So how can hypnosis help with skin problems? Your mind is the root of all your bodily functions and has the power to make physical changes to your body. In fact, any physical change begins in and is linked to your mind. So it only makes sense to correct the problem where it originates. So what about all those acne cream products? They only have a limited effect as they aim to combat the acne once it has appeared. However, they do not stop it from coming back again and again. If you want to "fix" the problem you need to change your lifestyle and stop acne at the source to truly clear your skin forever. Don't keep suffering from the negative effects of having spots and bad acne! Clear your skin and acne, and gain your self-esteem and confidence back with the power of our subliminal mp3 today! After making your payment, simply click the "Continue to Website" or "Return to Website" link which will bring you directly to your file to download. This audio is specially created using subliminal messages that are embedded into background music. It is extremely powerful and effective because while you are listening to relaxing music, your mind is hearing the messages and changing. It will also stay fresh, because you will want to continue using it over and over. In addition, unlike a conventional hypnosis session this audio will not put you in a hypnotic trance. So you can listen to this audio on the go. Everyone is different - so as a general rule of thumb, we recommend listening to this audio 2 to 3 times a week. However, because they it is 100% safe and relaxing in nature, you can continue to listen as often as you'd like and for as long as you'd like. Another important tip is DO NOT listen while driving or performing any other tasks that require your full attention. Although this audio will not put you in a hypnotic trance, it is still designed to be relaxing in nature. Follow these simple tips and directions and YOU TOO, will achieve the success that you deserve.